The peculiar lot dimensions (8,66 by 50 meters) allowed an interesting spatial sequence: a preexisting volume that leaves the original facade, an ample courtyard, the house, rear porch and the rear garden. Thus the house itself is a second facade. 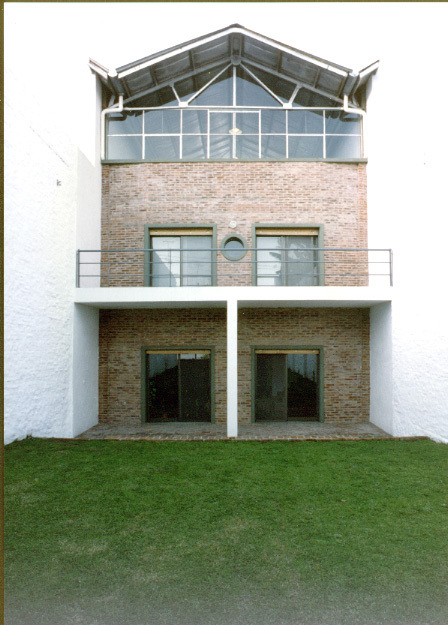 Its exterior walls are of load bearing exposed masonry, the openings are framed with cement ribbons. The ground floor plan was conceived as a continuous interlocked layered space, engaging a fluid and informal relationship among the diverse areas (kitchen, dining, living). The low glass blocks walls allowed both precise and ambiguous spatial limits. 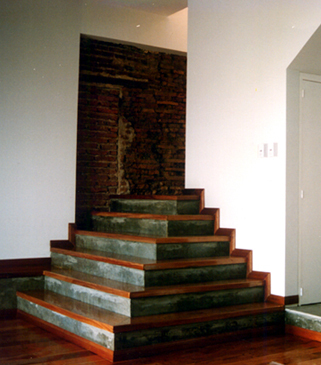 The staircase was conceived as a sculptural feature, a stepped slope invading or falling into the living room. The steps can be used for both climbing and/or seating. The transition to the garden is through the rear porch, a buffered space that relates the outside and the inside.